The dust from the controversial issue of dispensing separation has settled with the issue seemingly forgotten by both the medical community and the public. To recap, the issue began with Mr. John Chang, then President of the Malaysian Pharmaceutical Society (MPS) announcing at the MPS Annual General Meeting that the headlines on one of Malaysia’s English dailies were screaming ‘Clinics No Longer Allowed to Dispense Medication’. As expected, Mr. Chang’s announcement brought great cheer to the pharmacists assembled on that day. For many, it was a dream that finally came true. It was essentially a sign that the profession was finally given its due recognition and its due respect. After all, the dispensing of medications is the foundation of the pharmaceutical profession and to deny pharmacists the sole right to dispense medications would be tantamount to telling doctors that they did not have the sole right to practice medicine. Suffice to say, there was such joy that even the pharmacists in Singapore (who similarly, have not been given the sole right to dispense) took notice. It was to nobody’s surprise that the doctors immediately responded to the news with comments that were suffice to say, negative in their nature. They were naturally concerned at the impending loss of income and immediately dusted off their 50 year old excuses against awarding pharmacists the sole rights to dispense. It was all, in a nutshell, to be expected. What took the pharmacists by surprise however, was the ferocious backlash from the public. Quite simply put, the public didn’t want it. They were worried that in awarding the pharmacists the sole right to dispense, they would suffer extra costs, extra hassle and questioned why pharmacists should have the sole right to dispense. After all, the doctors were supposed to be the experts in the art of medicine and it was ludicrous to have to visit a pharmacy to get their prescription medications. With the public so strongly opposed to the idea, the Ministry of Health had no choice but to publicly refute that the dispensing separation would come into force any time soon. In fact, it was claimed that the dispensing separation was just a notion that was tossed around for discussion and it would be a long time coming. There was no cause for concern. A few pharmacists did try to respond in the newspapers on why there should be dispensing separation but alas, the public had made up their mind. It was bad enough to have to wait and pay the clinic for treatment, what more to have to go look for a pharmacy and pay another smug, white-coated health professional. With that, the issue was silenced, seemingly put back onto the shelf. The pharmacists were naturally incensed and quite upset over the whole affair. It was appalling to note the petty reasons hurled at them by the public against the idea of dispensing separation. They wondered why the public could not see the importance of dispensing separation. After all, the public should know that pharmacists are health professionals that are highly trained to ensure that the medications prescribed to them are not only safe for use but are also the correct medications to be used. The public should have known that pharmacists provide a vital safety checkpoint in ensuring patient safety. The public should have known that pharmacists can and will give the proper instructions and counseling on how to use their medications as well as manage their condition. Unfortunately for the pharmacists, that was precisely the problem. The public did not know all these things. What the public did know was that when they were sick, they went to a doctor and when they had a toothache, they went to a dentist. When they needed their eyes checked, they went to an optometrist and in the unfortunate event that they were warded in the hospital, they were cared for by the doctors and nurses. The pharmacist simply did not feature in the man on the street’s perception of healthcare. Generally, the Malaysian public’s knowledge of pharmacy and pharmacists was limited to the place they had to pick up their medications at the hospital (after enduring another wait) and the place they went to buy personal hygiene products. Thus, in the absence of the necessary knowledge to support the separation of dispensing, the public used what they knew best: daily concerns of time and money. It is now apparent that pharmacists must quickly bring awareness to the public regarding the entire profession of pharmacy. The public must firstly be made to know who pharmacists are and what do they do and how their work affects the healthcare of the masses. Pharmacists must integrate themselves into the public perception of healthcare and establish a role for themselves as the experts on medications and drug therapy. It is essential for the profession that pharmacists gain the confidence and trust of the public to a degree that the public will voluntarily seek out the pharmacists for consultation. It also should not be necessary to mention that in their efforts to gain the public’s trust, pharmacists must uphold themselves to the highest degree of ethics and abide the law to the letter. Some members of the profession may have that Asian bent of mind that one should not brag and toot one’s own trumpet as it lacks of taste. However, in the modern and competitive world, it can be assured that if one does not toot one’s own trumpet, no one else will do it on behalf of them. While bragging and exaggerating the profession’s achievements and contributions is distasteful (and potentially disastrous), there is no harm or shame in simply telling the truth about all that the profession does, which incidentally is a great deal and of great importance, to the public With that in mind, every pharmacist, from those in academia and clinical settings to those in community pharmacies, must do their bit to bring awareness to the public for if the situation is not remedied, pharmacists will soon find themselves sidelined and eventually be made redundant. The take home message is this: If the profession does not stand up for itself, it may as well just lie down and die. Imagine a desolate field surrounded by lonely roads, imagine that you are walking alone in the forests, with only the wind giving you the whispers of muse. Say you are standing on the top of the highest mountain but no-one is there to see you, say that you dived into the deepest depths of the earth but no one knows you are there. That is what the Malaysian Pharmacist blogger is feeling rite now. So send in your contributions to malaysianpharmacist@gmail.com !!! As a pharmacist and erstwhile citizen of the nation... These are indeed heady times to be a Malaysian Pharmacist - with many changes in the politcal situation (like our recent politcal tsunami) as well as the potential fundamental change in the healthcare mindset of its people - an impending dispensing seperation. All the difference in the world! For the consumer, the patient, the public - it represents a balance system of checks and balances (much in the similar vein as a strong opposition in parliament). It represents an inclusive system of which the doctor and the pharmacist work as a team in their respective fields of expertise - diagnosis (doctor) and treatment (pharmacist). This will lead to better control of rational drug usage as well as cost savings for the patient - in terms of better cost benefits of generics (the patient is no longer limited to whatever the doctor has on supply) and in terms of better therapeutic outcomes (i.e. correct drug for the correct use at the correct dose at the correct time = correct treatment = happy patient). In addition, the patient can be comforted by the fact that the doctor-pharmacist team leaves less room for error! In exchange for that, a little inconvenience is a small price to pay. To the Pharmacists (i.e. us), Dispensing Seperation means that we get back what is rightfully ours - Not just the right but the responsibility of dispensing. To that effect, we must work ourselves to be fully prepared to assume this responsibility - be it in professional practice or working together towards this goal. To that effect, we have to fully participate in this process of seperation - assuring the public of our ability to do the job, putting a system in place to provide the best level of care to our patients, working with doctors to achieve a working relationship for dispensing seperation to work and lastly (and most importantly) come together with other pharmacists (i.e. in MPS) to get dispensing seperation a done deal! In addition, the public and the doctors all fear the unknown and uncertainty. To that effect, we have been getting some bad press in our main stream media. We have to step up to the plate and counter this - on the same media or on this internet media. Thus, we must be prepared to come out with opinions as well as clear cut ideas on how dispensing seperation needs to be implemented and put it to the public, educating them and proving to them that we have the ability to do this. 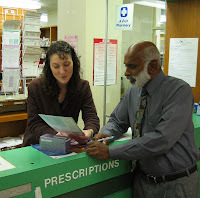 In many countries, pharmacists are amongst the most trusted professionals (in Australia we are number 1!). It is time for us to assume this mantle in Malaysia. We need to go forward so that we can hold our heads high - proudly saying that we are indeed Malaysian Pharmacists!